I probably chose the two most difficult fruits to find commercially to combine into one jelly. 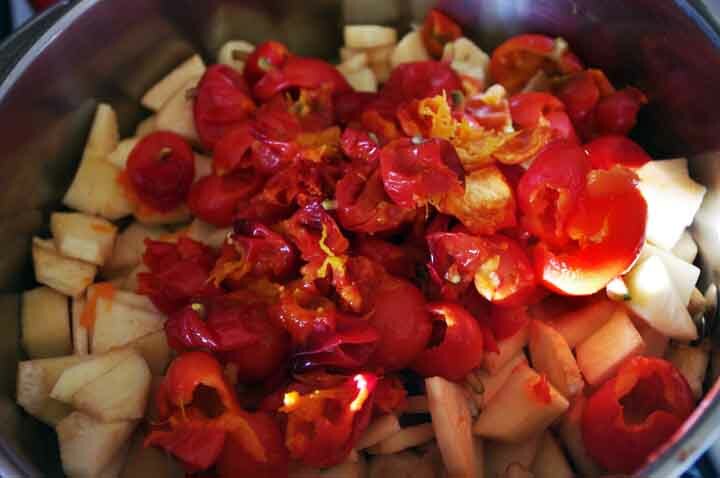 Rose hips are available, but they are generally dried, and difficult to remove the seeds from. But if you’re lucky enough to have a quince tree and rugosa roses this is a fantastic way to combine them into a deliciously bright jelly. I was excited this year when my rugosa roses started producing hips. The bright orange and red balls that show up after the flower petals fall off are renowned for their high Vitamin C content and are popular for teas. They are also good as a stand alone for jellies, but because the fruit has little naturally occurring pectin in them, you have to add commercial pectin. 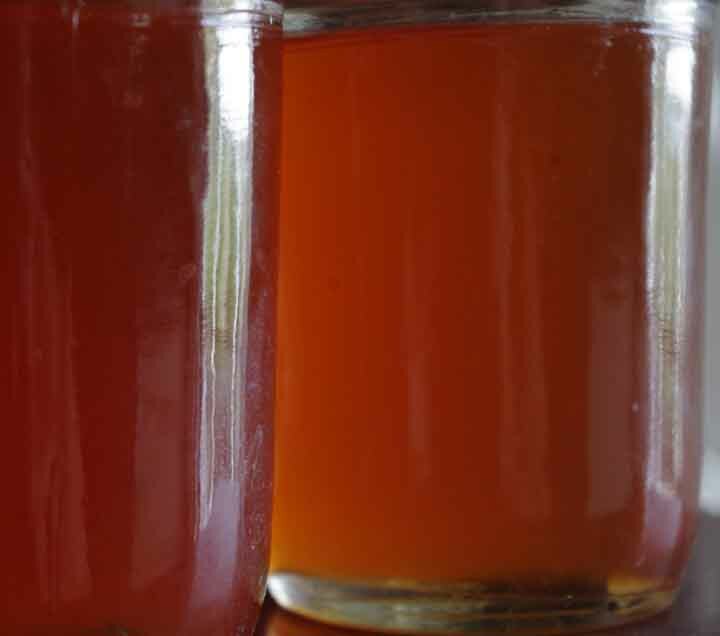 Rose hip jelly also requires gallons of hips to make a relatively small amount of jelly. Being that this was our first year of getting hips from our two rugosa roses, I knew that I wouldn’t have enough to make a full on jelly. As it turns out our quince tree went gang busters this year and it’s only in it’s second year. Quince also has a lot of natural pectin in it and since the fruit is generally more woody than other pome fruits, cooking it is usually required. It became apparent that these two fruits would be a lovely combination. All I had to do was wait for the quince to ripen. In the meantime I picked the rose hips while they ripened and froze them. 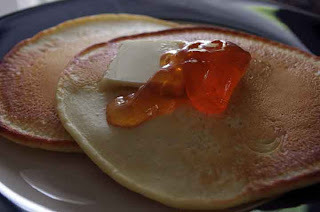 I found that freezing them made them a lot easier to clean when it was time to make the jelly. You want to make sure to remove the tannic seeds from the rose hips or the jelly will become bitter. With the frozen hips you simply thaw them, tear off the sepals (petal like structures) and squeeze out the seeds. The fresh hips proved a little more difficult and I ended up with seeds everywhere. 1. 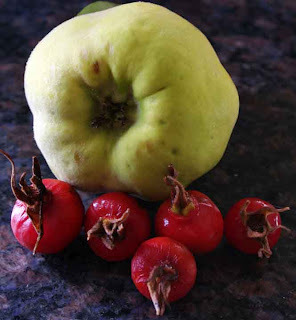 Put the quince and rose hips together in a large pot. Add water until you can see it just under the top layer of fruit. Bring to a boil. 2. Boil fruit, uncovered, until it is soft. Strain liquid into a new pot. Save fruit for other uses if you want. 4. To check consistency: put some ice in a bowl. Scoop up a small amount of liquid with a spoon and place the spoon on the ice to get it to cool quickly. Turn spoon sideways. 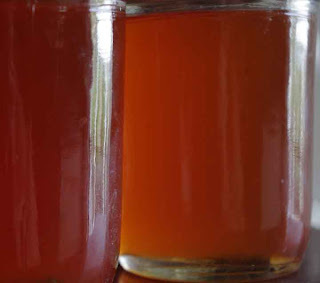 If the liquid has jelled onto the spoon and doesn’t appear syrupy then it is done and ready to can.